Professor Xun Gong and his doctoral student Haitao Cheng. 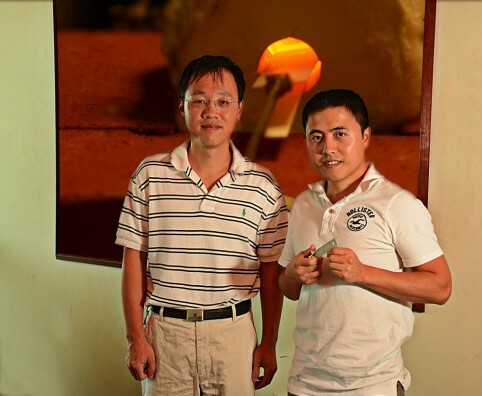 Cheng is holding the antenna he created to withstand record temperatures (the image in the background shows the antenna under test in the ceramic furnace in Gong’s lab). A UCF engineering team has developed an antenna capable of surviving a record temperature of 1,300 degrees Celsius, a potential boon to manufacturers of high-performance turbine engines. Haitao Cheng, a Ph.D. student working with Professor Xun Gong, used a unique fabrication process to construct the antenna, about the size of a stick of gum. The antenna communicates with a nearby ceramic sensor to detect temperatures in environments where most materials would melt. The research, funded by a $950,000 grant from the U.S. Department of Energy, was designed to address the problem of efficient temperature monitoring of turbines – machines that produce most of the world’s electrical power and propel aircraft. Turbine manufacturers are interested in making their machines run at higher temperatures to improve their efficiency, however the fuel that runs the machines burns at higher temperatures than most materials that can be used to measure temperature. “Currently there are no sensors that can continuously and accurately monitor the temperatures of turbines,” said Gong. Most antennas are configured on printed circuit boards (PCBs) which cannot survive extreme temperatures. Cheng wanted to create something that maintained the characteristics of PCB antennas but would be more robust and easily reproducible. His solution was to create antenna layout on transfer paper, transfer the layout onto a sheet of alumina, and coat the finished device with a platinum paste. Using a ceramic furnace in his UCF lab, he measured the antenna up to a temperature of 1,300 degrees Celsius, a record for published literature. This antenna is currently being used in the wireless sensing of high-temperature sensors developed by him and his teammates including Xinhua Ren and Siamak Ebadi. Cheng presented his results in a paper to the IEEE International Symposium on Antennas and Propagation last month. He said he is ultimately interested in designing robust antennas for use in future space missions, to planets as distant as Venus where the environment is characterized by high temperatures and corrosive gases.